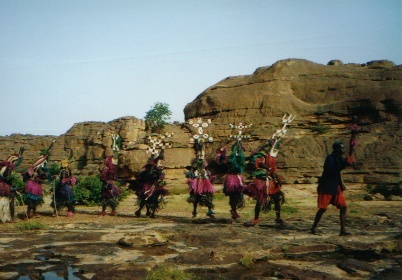 The Cliff of Bandiagara (Land of the Dogons) is a zone of tablelands, gorges and plains that is inhabited by the traditionally living Dogon people. This sahelian region covers 350,000 to 400,000 hectares. It was inscribed both for natural and cultural reasons. The Dogon are one of the few people in West-Africa that have succeeded in preserving their own culture very well. The reason for that is probably the remote position of their living area. The Dogon-villages, with their traditional architecture of clay, are near or on the Falaise. To this cliff the Dogon have withdrawn themselves centuries ago on their flight from the muslims. The Falaise is one of the most impressive geological and landscape features in West Africa. It consists of red-colored rock. The slopes are steep, but the top, with a width of several kilometres, is quite flat. 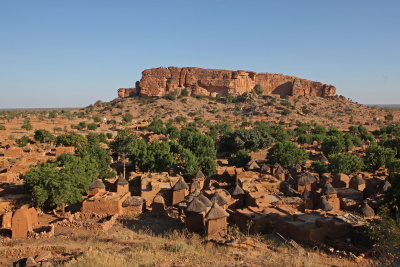 Bandiagara is situated in central Mali (near Mopti) and is a good place for trekking from town to town. I did a 4-day trek, staying overnight in the villages of Bankas, Ende, Yabatalu and Begnimato. During the day we walked from village to village. It was a very memorable trip: admiring the fabulous ornamented woodwork of the doors, visiting the Hogon (traditional priest) and a mask dance was staged for us in the early morning hours. 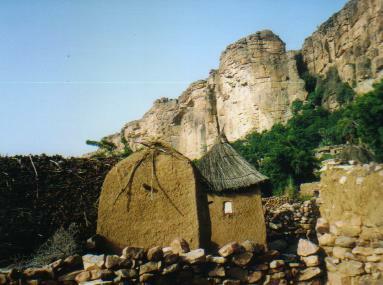 The Dogon villages of the Bandiagara Falaise are undoubtedly one of the great sites of Africa. We did a 5 day trek among them and would love to return for a second visit. Even in December it is a very “hot walk” and I almost wonder whether a longer stay in 1 or 2 villages would be preferable to moving every day – the scenery doesn’t change that much and the essence of the place is to be found in the people and their culture. With French as a lingua franca and a local guide it was possible to interact. We learned the Dogon greeting with its extended list of polite questions and formal replies about a vast series of subjects. We saw the divination enclosures where the overnight footprints of desert foxes crossing prepared sand grids are used to foretell the future. 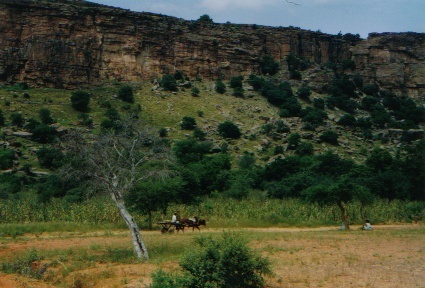 We had discussions with locals who seemed prepared to forgive our unwitting social gaffes - eg I was politely asked not to lean on a particular rock – in Dogon animist beliefs “inanimate” objects possess significance which is not obvious to the outsider! We also had a masked dance performance (photo). We asked ourselves whether our presence was for the better or were we killing what we had come to see. Well probably both. Looking back over almost 50 years of travel I can see that what appears to be permanent is in fact quite impermanent whether it be a natural site, city or culture. Wherever I have been I have met people who have told me “You should have been here n years ago – it was far better”. And that isn’t going to change. But better for whom? The Dogon villages will change – hopefully for the betterment of those living there but hopefully also they will retain enough of what makes them special. I fear however that in years to come the dances will be presented in tourist oriented auditoria rather than being watched, as now, from among the rocks - just look at Bomas of Kenya. Already there are roads down the cliff and trucks running along the bottom – no doubt traffic will increase and locals will (quite rightly) covet and acquire motor scooters – the long greeting as walker passes walker will become a thing of the past. Then gradually the villages will develop with new buildings of concrete and corrugated iron and their original architecture will be “ghettoised”. So GO NOW! Masks: The Dogon have complex religious rituals that involve animal masks.